EVON is dedicated to understanding how organic works, and how to improve current practices to better address challenges and to benefit the work of farmers. Below is a list of various projects we've focused on. We also welcome outside research collaboration! If you would like to do a research project involving EVON's practices, land, or plants, please contact us to set up a meeting to discuss your proposed work. It's also very important to us that any research project conducted at EVON submit results and reporting to EVON staff as a follow-up. This way we know what was learned, and can incorporate results into our work in the future. Dynamic Accumulators -- we can manipulate the content of certain nutrients in finished compost by adding larger quantities of local plants that are known to be high in those nutrients. For example, to make a compost high in phosphorous, we may focus on additions of mustards, buckwheat, alfalfa, walnut husk, corn, sunflowers, marigolds. This technique is especially important for addressing nutrient deficiencies in remote areas that do not have access to purchased materials like pina, bonemeal, and other organic fertilizers. We are currently investigating the nutrient value of local weeds for this purpose. If you have information on the nutrient contents of any of these local plants, please share with us! The important concept here is to introduce nutritional diversity into the soil through adding various different types of plant biomass, whether planting vegetables or trees. SRI Rice (System of Rice Intensification) -- SRI Rice differs from the traditional Nepali method of growing rice, which usually transplants 4-5 seedlings in one hole, and keeps the terrace flooded. SRI Rice is grown with only one seedling per hole with 8-14 day old seedlings, and irrigated intermittently instead of flooding, with seedlings transplanted slightly farther, about 25-30cm apart. EVON's Insect & Disease Inventory and Treatments -- The resulting report of a 3-year research project at EVON, funded Dzi Foundation, in partnership with DADO entomologist Madhu Sudhan Paudel. EVON's Soil & Materials Nutrient Analysis -- See the lab analysis data for pina, wood ash, bonemeal, and compost samples taken at EVON, as well as our general soil characteristics from samples taken in 2014. EVON's 3-year Yield Comparison Study -- Compared between five treatments of 1) sheet-composting; 2) 1-ft double-digging; 3) 2-ft double-digging; 4) Nepali traditional; and 5) chemical fertilizer. Funded by the Dzi Foundation through the ZORO project. 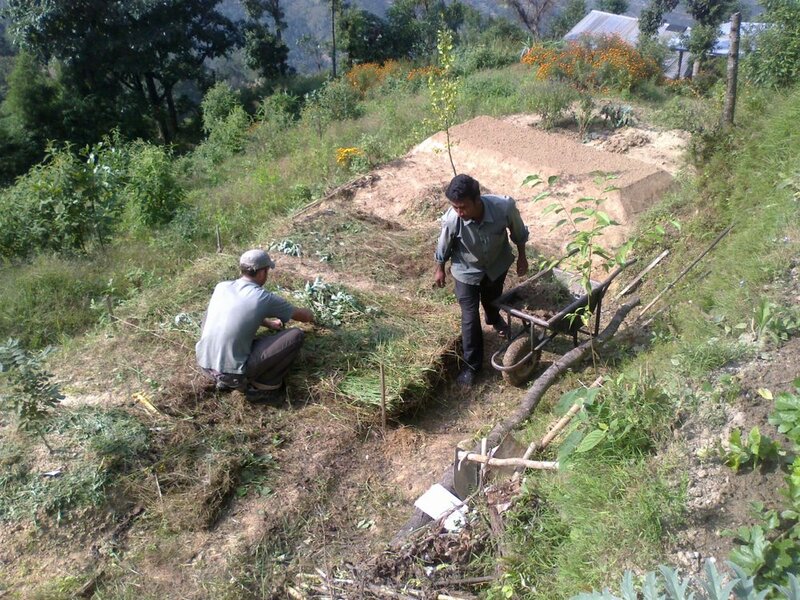 Overall yields were highest in the biointensive sheet-composted beds, and lowest in the traditional Nepali-style beds. Everything Organic welcomes donations in support of our research.